Parents of teenagers may think they do not have much influence on their kids, but when it comes to safe driving, they do—and it could mean the difference between life and death. From 2004 to 2011, rates of motor vehicle crash deaths among 15-19 year-olds in Colorado dropped more than 67 percent. * However, in 2012 Colorado experienced a 10 percent rise in teen fatalities from 2011. 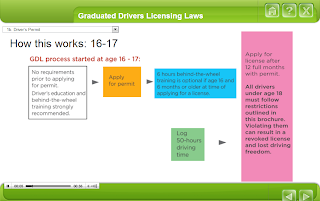 The Colorado Teen Driving Alliance, with support from state public health, has created an online parent course that provides step-by-step instruction on how to support their teen through Colorado’s Graduated Driver Licensing (GDL) laws, which are designed to phase-in beginning drivers. This course was prompted by a new CDPHE survey of 738 parents of teens throughout Colorado, which showed that only 6.4 percent of parents could accurately identify each component of GDL laws, including curfews, passenger restrictions and seat belt requirements. To print postcard size promotional materials for the course to accompany other parent educational materials, use this document. Spanish print versions of the materials are available below. A Spanish version of the online course should be available by Summer 2014. For more information on teen driving safety, go to COTeenDriver.com.